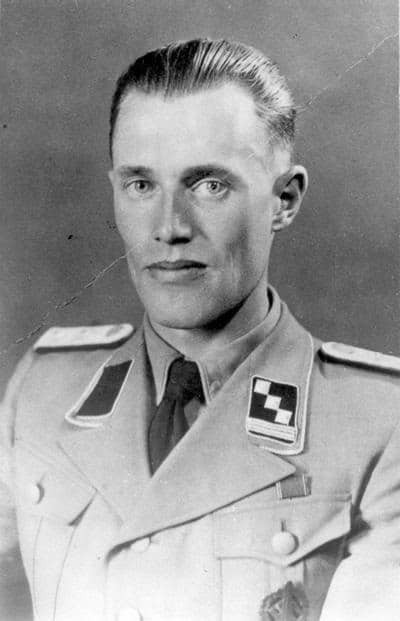 SS-Hauptsturmführer Franz Novak was born on January 10, 1913 in Wolfsberg in the Carinthia district of Austria. The son of a locomotive driver, he joined the Hitler Youth and subsequently the Nazi Party. Following the assassination of Engelbert Dollfuss, the Austrian Chancellor who had banned the Nazi Party, Novak fled to Germany. The crime occurred on July 25, 1934, when ten Austrian Nazis entered the Chancellery building and shot Dollfuss to death; Novak was involved in the plot. 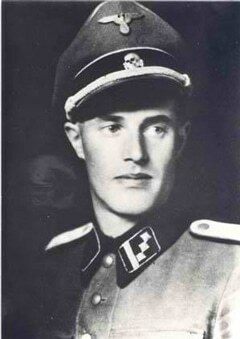 In 1938, he joined the SS and Security Service. Following the Anschluss, Novak returned to Austria, working in the Central Office for Jewish Emigration, first in Vienna, then Berlin, and finally in Prague. Novak was SS-Obersturmbannführer Adolf Eichmann’s railroad and transportation timetable expert and thus occupied a liaison role with the Ministry of Transport. Once Eichmann had coordinated the deportations of Jews from a specific region with that area’s local government, he would assign his deputy, SS-Sturmbannführer Rolf Günther the task of arranging transportation. Günther, in turn, notified his subordinate, Franz Novak, of the number of people to be deported, the origin of the proposed movement and the final destination. Novak then contacted Office 21 of the Reichsbahn Traffic Section and the railroad men would handle the rest. Novak worked with Eichmann on the deportation of Hungarian Jews in 1944 to Auschwitz. After an appeal, a retrial was ordered in 1966 and Novak was acquitted. This reversal did not sit well in Austria. Two years later, the Austrian Supreme Court revoked the result of the second trial and ordered a third trial. This court, meeting in 1969, issued a unanimous verdict of guilty, resulting in a sentence of nine year’s imprisonment. Novak’s attorney pleaded for a nullification of the verdict and Novak was not re-arrested. After the third appeal to the Austrian Supreme Court, a verdict of guilty was handed down by a court in 1972. The ruling explicitly denied that Novak was obligated to obey binding orders. However, he was convicted not for murder, but for committing “public violence under aggravating circumstances” by transporting human beings without providing sufficient water, food and toilet facilities. Seven of the eight members of the jury did not convict Novak of being an accessory to murder. He was granted a pardon by Austrian President Rudolf Kirchschläger. Franz Novak died on October 21, 1983 in Langenzersdorf (just north of Vienna), Austria.